Liberty of London’s Tana Lawn prints are some of the most beautiful fabrics in the world. The woven cotton is so smooth that it feels like silk. The designs are intricate, distinctive, and insanely lovely. The colors are rich and sophisticated. The fabric cuts and sews like a dream. 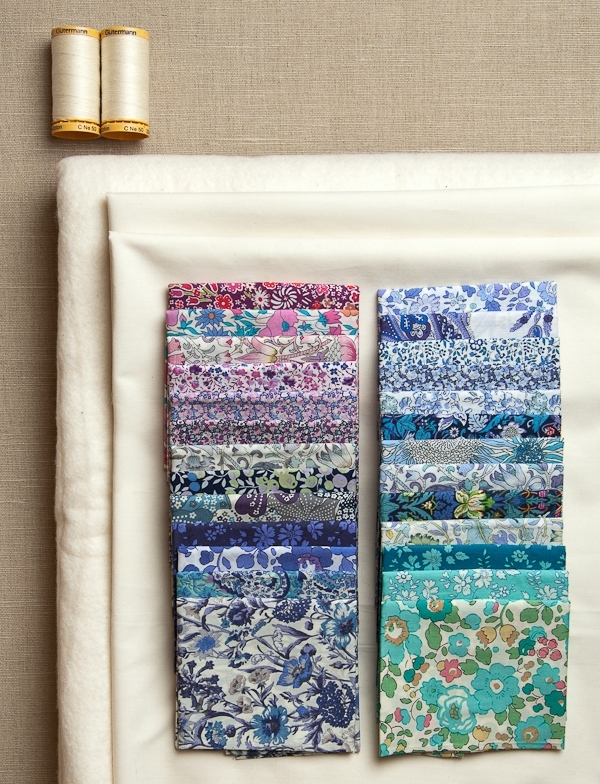 My Prism Quilt in Liberty of London is the ideal way to celebrate these extraordinary fabrics. I used Purl Soho’s Liberty Half Rainbow Bundle, which includes twenty-six Tana Lawn prints in either a Warm or Cool spectrum (I used Warm), and I paired it with Moda’s super soft 200-count Muslin. 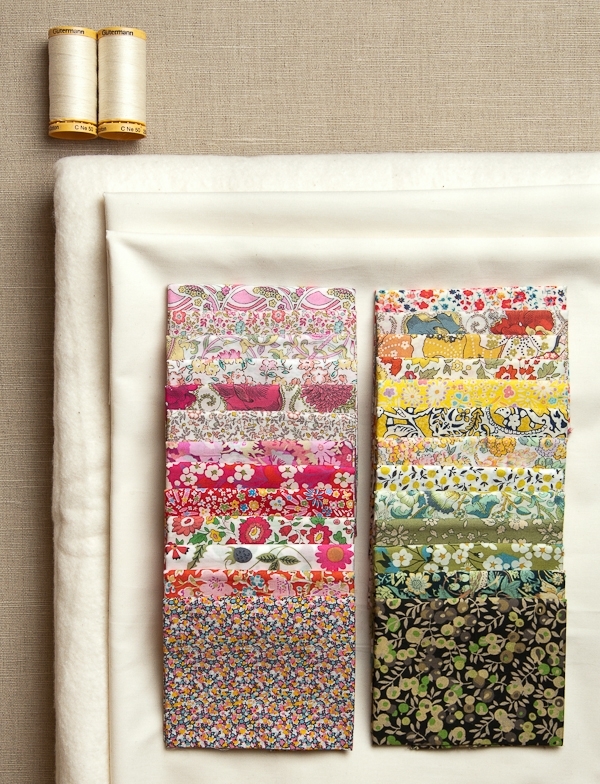 The result is a true heirloom quilt, traditional in approach and modern in design. 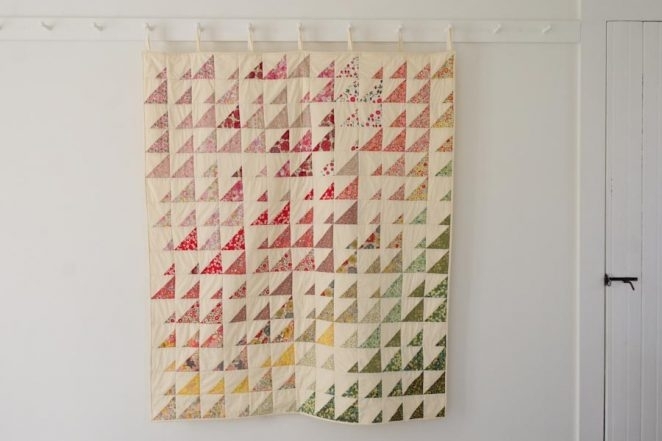 We made the Prism Quilt with the Cool Bundle, too! If that’s more your mood, read all about it here. Prewash all of the fabric but not the batting. All seam allowances are 1/4 inch. 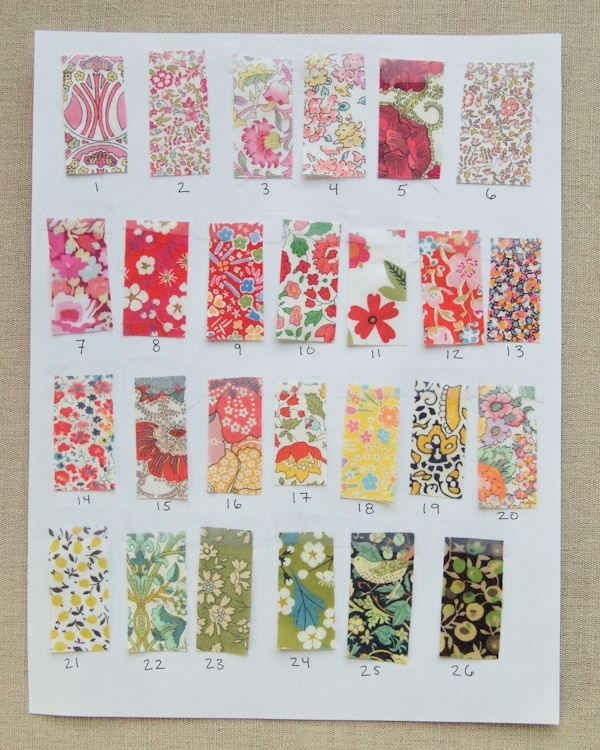 I found it helpful to have a Print Order Chart of all 26 Liberty prints. If I ever got confused about which ones I had already cut or my prints got out of order, it served as a good reference. To make your own chart, just cut a 1 X 2-inch swatch from each fabric and tape these swatches to a piece of paper in the order in which they are folded in the Bundle. You don’t really need the numbers, but I found them helpful to make sure all 26 fabrics were represented. Try to keep the fabrics organized by color and size as you cut and throughout the rest of the pattern! Six 2 ¼ X 42-inch strips. These are the Binding Strips. Put these aside until the Binding section of the pattern. A rectangle 60 inches wide X 68 inches tall. This is the Backing Fabric, which you can put aside until the Baste section. 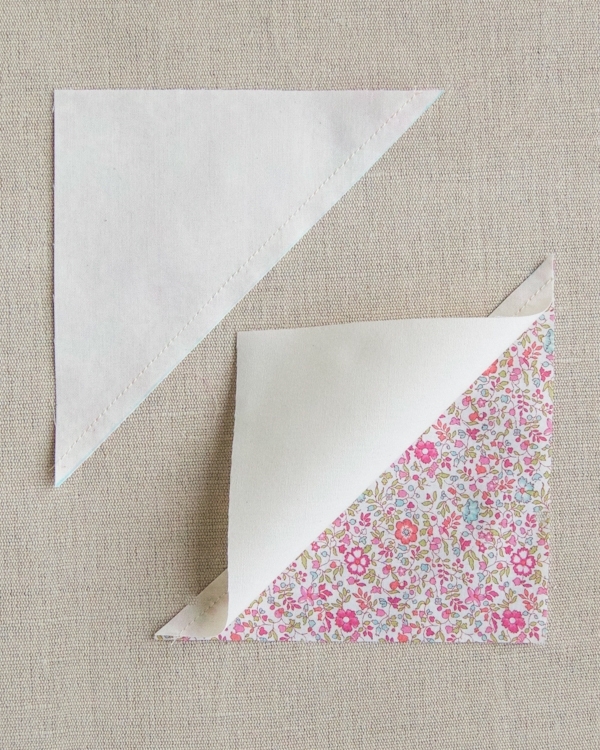 Gather all of the 4 7/8-inch square pieces, both in Liberty and in Muslin. Note: Please be sure to also read our Chain Piecing Tutorial, if this is your first time chain piecing. 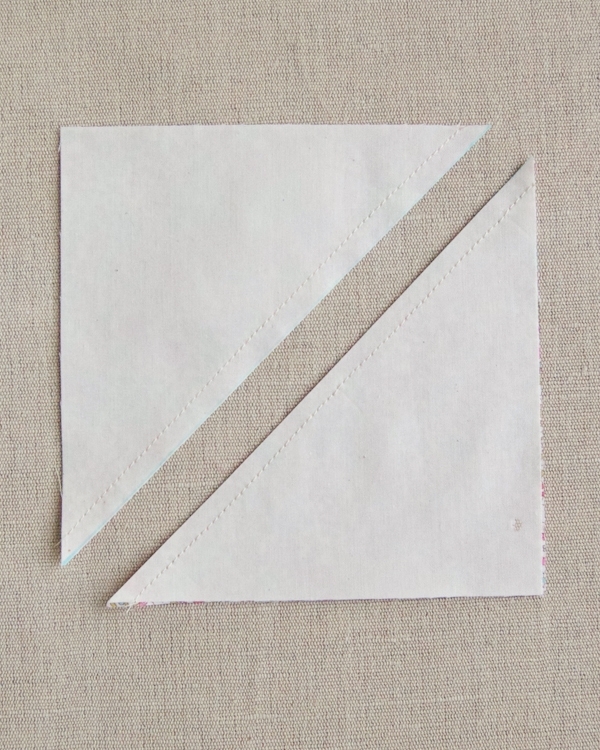 Using the Water Soluble Fabric Marker, mark each Muslin Square from corner to corner with a diagonal line. This is the Diagonal Mark and it is on what-is-now the wrong side of the square. Pinning along the Diagonal Mark, pin each Muslin Square to a Liberty Square, right sides together, until you have 52 pairs. Chain piece the pinned pairs together, first by sewing ¼ inch from one side of the Diagonal Mark and then flipping around the pieces and sewing a ¼ inch from the other side of the Diagonal Mark. Once you’ve sewn all of the pairs and clipped them apart from each other, use your rotary cutter and non-slip ruler to cut along each Diagonal Mark. This yields two triangle shaped pieces from each pair. Press all of these pieces open so that they form a 4 ½-inch square, pressing the seam allowances towards the Liberty side of the square. 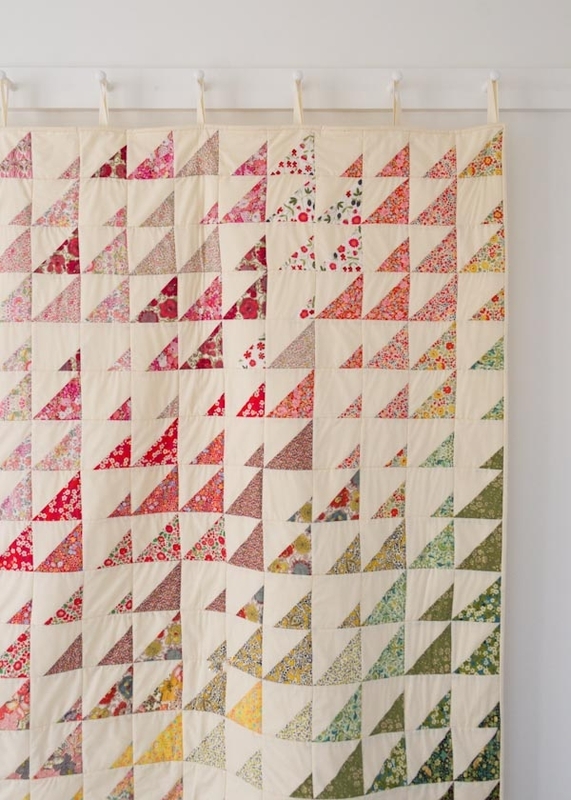 Gather all of the remaining cut squares (the 104 Muslin 4 ½-inch squares and all of the Liberty 2 ½ and 3 ½-inch squares, 52 of each). On its wrong side, draw a Diagonal Mark across each of the Liberty Squares. 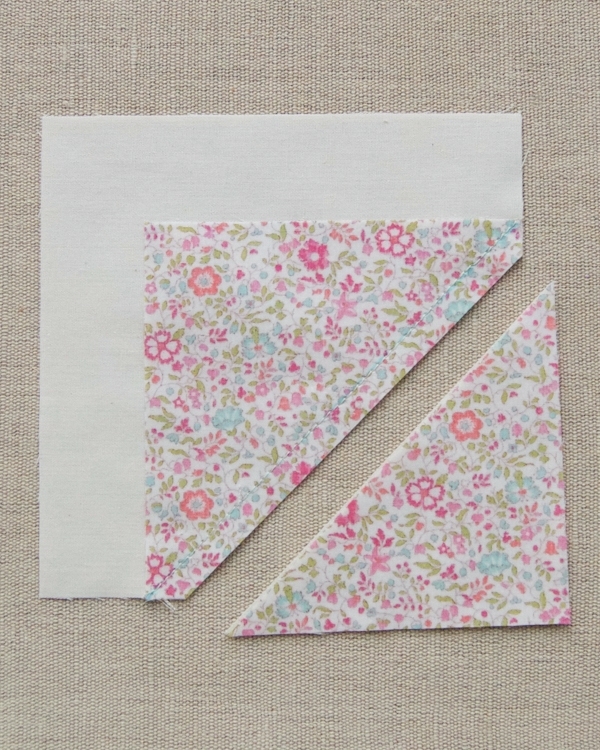 Pin a marked Liberty Square to any corner of a Muslin Square, right sides together, matching up the corners perfectly. The Diagonal Mark should run from one edge of the Muslin Square to another and not bisect the corner. 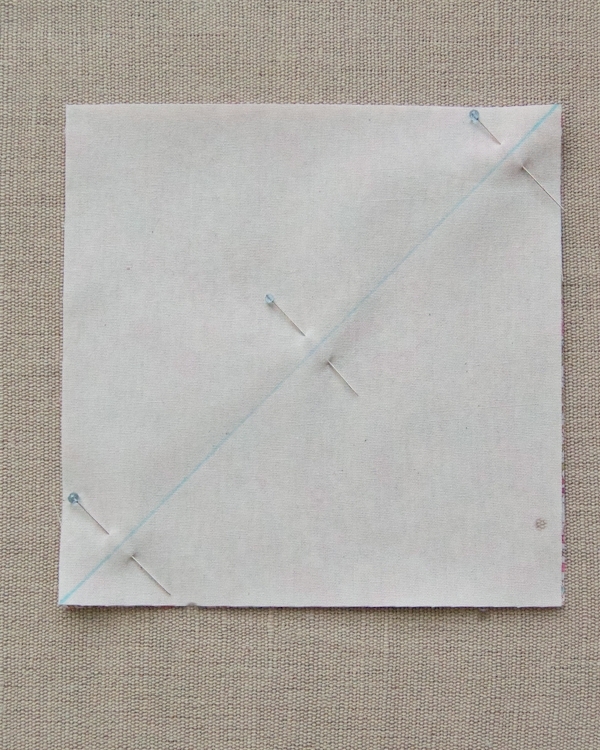 Repeat this marking and pinning until you have pinned all of the remaining Liberty Squares to the remaining Muslin Squares. You will have 104 pinned pairs. Chain piece all of the pinned pairs together along the Diagonal Marks and clip the pairs apart. Lay a pieced Square out with the Liberty Square on top and oriented at the bottom right corner. Trim the corner where the Liberty is attached, ¼ inch from the Diagonal Mark. Discard the trimmed corner, or save it for another use. Press the Triangle downward, pressing the seam allowance towards the Liberty side of the square. Repeat this for all of the remaining sewn pieces until you have 104 Medium and Small Triangle Corner Blocks. Now for the fun part! Clean a flat section of floor and, keeping the squares oriented so that the right angle of the Liberty triangles are at the lower right hand corner of the squares, arrange your blocks into a grid 13 squares wide and 15 squares tall. You can arrange them in any order you like. Note that you can expect to have some squares left over! I came up with my layout by starting with Print #1 in the top left corner and arranging the pieces diagonally in color order until I got to Print #26 in the bottom right corner. I alternated between using 6, 7, or 8 squares of each print. Once I had this initial layout, I moved some blocks around to make things a little less orderly. Once you have settled on a layout that you like, take a photo of it (just in case anything goes awry in the next steps!). You should have 15 horizontal rows. Row 1 is at the top and Row 15 is at the bottom. First pick up the right-most square of Row 1, then pick up the next square to the left and stack it on top of the first, keeping the squares oriented so the right angle of the triangles are all at the bottom right corner of the square. Continue in this manner until all 13 of the squares from Row 1 are stacked, with the left-most square on top and the right-most square on the bottom. Mark the first square with a “1” (for Row 1) and put the stack aside (I kept each of my stacks in labeled plastic bags). Repeat this process until you’ve picked up all 15 rows, making sure to keep them in order, neatly labeled. Gather the first two pieces of Row 1 (the upper left corner square and the one to its right). With right sides together, pin the right hand side of the first square to the left hand side of the next one. Working in row order, pin all the first and second squares of all of the remaining rows in the same manner. Once you’ve pinned a pair, stack it immediately on top of the previously pinned pairs. This way you’ll keep the pairs in row order. Chain piece each of these 15 pinned pairs together, keeping them in row order. Next, clip the first pair of squares free from the chain and pin the left side of Row 1’s third square to the right side of Row 1’s second square. Repeat this for all the rows and then chain piece these pinned pairs together, keeping them in row order. Continue to build the rows like this until you’re finished with 15 rows consisting of 13 squares each. Press the seam allowances of Row 1 and all other odd number rows to the left. Press the seam allowances of Row 2 and all other even number rows to the right. With right sides together, pin the bottom edge of Row 1 to the top edge of Row 2. Make sure to line up the seams between each square as perfectly as possible. Since the seam allowances are facing opposite directions, these seams should be easier to line up with one another. Use lots of pins! 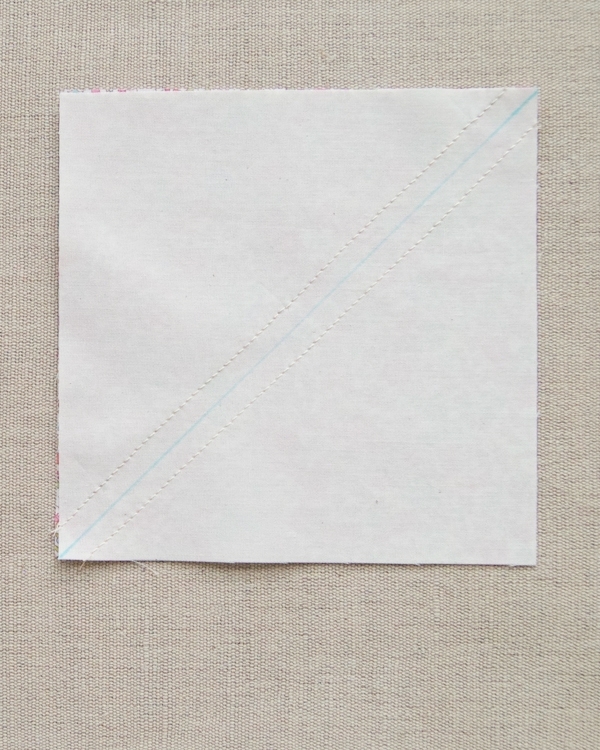 Sew the two rows together along this pinned edge and then press the long seam allowance downward (towards Row 2). Repeat for all of the remaining rows, pressing all of the long seam allowances downward. Once you’ve pieces all 15 rows together in order, your quilt top is done! You can quilt in any pattern you like! We chose to “stitch in the ditch” for our quilt, sewing along every vertical and horizontal seam of the quilt top. 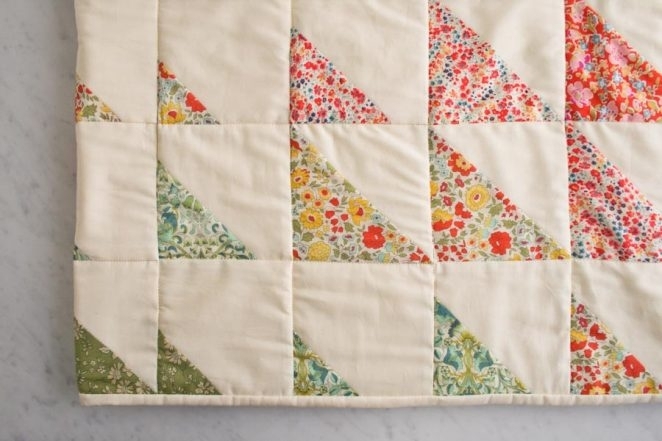 To quilt by machine, use your machine’s walking foot and sew right next to the seam. For the horizontal seams, sew along the side of the seam without the seam allowance. Once you’ve finished quilting, trim the batting and Backing to match up with the quilt top. Use the Binding Strips you cut to bind the quilt with double fold binding. For instructions on how to do this, please check out our Making Double Fold Binding and Sewing on Double Fold Binding Tutorials! Thank you, once again, for a simple, step by step tutorial, that is easy to follow. Makes sewing such a joy, when one can find a tutorial like this one. Happy Wednesday! I’ve never quilted before and this is convincing me that I really NEED to give this a shot. It’s beautiful! Thanks! Great pattern, now I know what to do with my Liberty fat eighths! Thank you! This is the year of my first quilt. 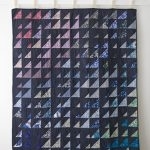 I would like to try my first quilt with the offered pattern. Thank you. This is lovely. I would like to make it for my child’s teacher. Any suggestions on how I might make it lap size in terms of the how much of each fabric I would need and how much to cut? I will figure out the layout. Any help you can give would be appreciated. 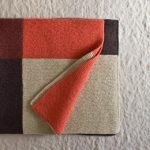 The blanket is 50 X 60-inches which is usually considered a throw size. But if you’d like to make it a bit bigger I think you will have enough of the liberty just with the one bundle, without buying more. Just make sure to cut carefully. I would buy an extra yard of the narrower muslin and a piece at least 8-inches larger than the quilt top for the backing fabric. To figure out how many to cut you’ll need to figure out how big you want it to be. Each finished square is 4″ so you can figure out how many to cut once you figure out the size. I hope this helps! Thanks for getting in touch! Quisiera preguntaros si podriaís poner los tutoriales en castellano también, muchas gracias.Me encanta todo lo de vuestra página. Gracias. Thank you for writing in! Unfortunately, we don’t have any Castilian speakers so we are unable to translate any patterns for your. I am sorry! But, again, thank you for commenting and for your kind words! Have you tried cutting and pasting the instructions into Google translate? Thank you for the step by step tutorial. It will be very helpful, as I’m just a beginner quilter. What is the finished quilt size? Thank you for your question. The finished dimensions of this quilt are 52 inches wide by 60 inches tall. I hope that helps. 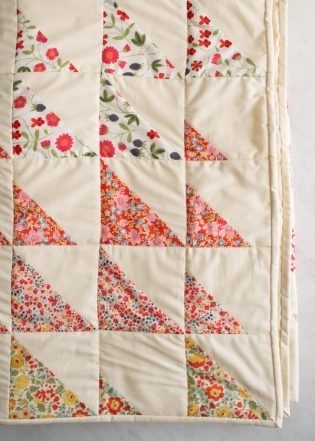 How difficult do you think this quilt would be to make without a sewing machine? I’m ashamed to admit it, but I’ve never learned to use a sewing machine, which has been the main reason I haven’t taken up quilting yet. This one is just so beautiful that I would attempt to hand sew it. Thank you for your questions. There is nothing to be ashamed of! 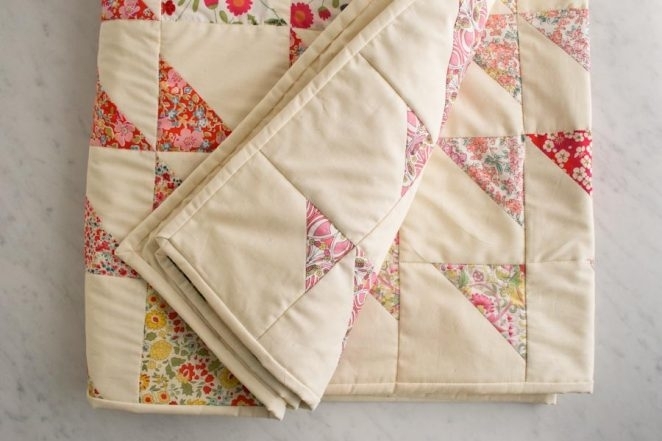 Hand quilting has a long, rich tradition. It would make a very special heirloom piece. I don’t think it would be difficult to do this quilt without a machine, it would just take more time. It would also make the quilt portable! You could take the blocks with you and stitch them when you are waiting in an office or riding in a car. I would just draw a line where the 1/4″ seam is and stitch along that line. There is a nice tutorial on this here. Let us know if you have any other questions and send us a picture when you finish! Thank you so much for the encouragement Allison, I think I’ll take the plunge with the “cool” bundle and place my order soon! I’m having a VERY difficult time finding enough yards of any of the muslin recommended. Could you suggest some alternates that I might have an easier time finding? Thank you! We have all of these fabrics in stock and for sale if you click on the links in the “Materials” section. The special thing about this particular 200 count muslin is that it has a silky feel, much like the Liberty of London Tana Lawn, but any good quality quilt weight cotton woven muslin or solid would work fine as a substitution. Just make sure to get fabric that is at least 60-inches wide for the backing piece. Hi Kellie: I’m writing hoping against hope that you live within a days’ driving distance of my home in Portland, Oregon. The reason I say this is that one of my husband’s hobbies is procuring lovingly used high quality sewing machines which the owners gave up in frustration because something went wrong. My husband is rather good at ferreting out problems, you see, so he makes repairs to these fine machines, locates owner’s manuals online, prints them out or transfer the info to a CD and sells them for a nominal fee. Could be you live on the East Coast, South or wherever that’s out of my reach. But, in any case, do let me know if I can be of help. If I/we can, I’d be pleased to spend time with you on the basics, as we both retired a couple of years ago, so I could make several trips. Hope you’re close enough to make this happen. I would love to make this for a male friend and I was thinking of using a black muslin. Do you have any recommendations for where I could get black muslin like what is used here? I love the dark indigo chambray! Since it is only 57″ wide, how much should I get? You can get the same amount to replace the 45-inch wide muslin. For the backing fabric you should get 2 yards. Thanks for getting in touch and please let us know if you have any more questions! Thanks so much for all the help. I’ve got my supplies and am so anxious to get started. Yes, prewash all of the fabrics including the fat 8ths. I haven’t had much problem with the Liberty fraying in the wash but you are welcome to zig zag stitch around the edges if you think that’s best. How much i need fabric muslin natural for backing, quilt and binding to make a quilt for a bed Twitter personnes, 160×220 cm ? 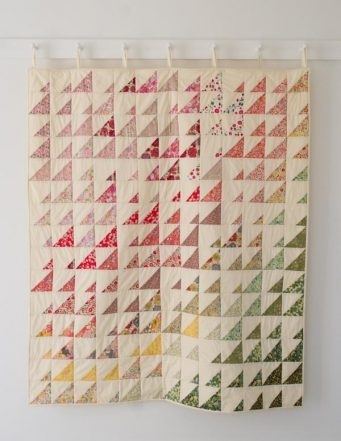 I love this quilt, a beautiful projet. Such a beautiful quilt! Do you have a suggestion as to how I would be able to scale this pattern up? I don’t have much time to sew so I want to make a version with larger blocks but figuring it out is making me feel a little crazy! Instead of 4″ blocks I would like to have 6″ blocks… Any tips? You can just cut every piece 2-inches larger. So instead of cutting 4 1/2-inch squares you’ll cut 6 1/2-inch squares, and instead of 4 7/8-inch squares you’ll cut 6 7/8-inch squares etc. 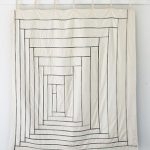 It’s just an estimate but I would buy an extra yard and a half of the 45-inch wide muslin and buy a 1 3/4-yard piece of the 90-inch wide muslin. 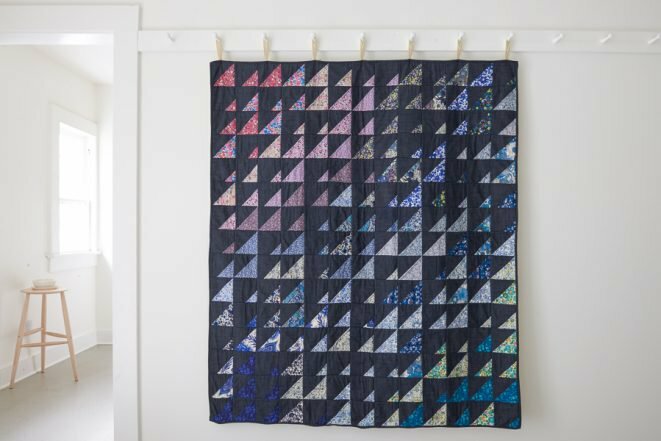 Your final quilt will be 78-inches wide by 90-inches tall. I hope this answers your questions. Please let me know if you have any more! Hi! If you wanted to scale this up to fit a queen bed, how would you suggest scaling the amount of materials to purchase? I would estimate you’ll need 5 yards of the muslin/ binding fabric, 2 liberty bundles, and 3 yards of 110-inch wide muslin for the back. Hi! I’d like to make this using the new Liberty Color Wheel Bundle. Will that be enough fabric? Thanks so much for such great inspiration and detail! Yes! It will be enough, and it will be beautiful! When piecing the squares for the rows together how much of a seam allowance should be used? 1/4″ ? Thanks for your question. All seam allowances are 1/4 inch. This info is in the “Notes” section of the pattern as well. I am using a Sisix to cut my squares. I have a 5″ die so I’d like to use 5″ squares instead of the 4.7/8″ squares called for in the pattern. Is this possible? 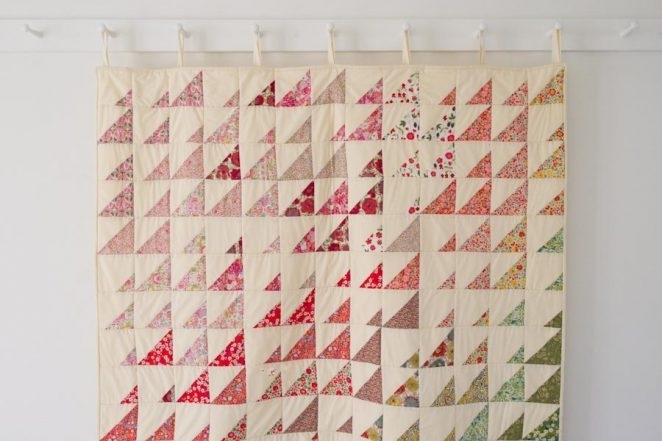 Don’t want to throw the rest of the pattern off and being new to quilting, I can’t get my head around whether this is possible. Your advice? No, a 5″ square won’t work for this. You need the 4 7/8″ to create the correct size of triangles with the method we used. Is this classed as cot size or would I use fewer blocks to make it cot size. And if so, would you recommend using fewer Liberty fabrics please? I’m embarrassed to say that I don’t know what size “cot size” is! But I googled it and it seems like about 27″ x 51″ inches, which seems very long and skinny to me! But if this is the size you’d like, you will need to make a quilt that is 7 squares wide and 13 squares long. And yes, you can use fewer Liberty fabrics if you like- it’s totally up to you! 40 X 50 sounds pretty perfect for a crib blanket. Since you are dealing with 4″ squares for this pattern I would suggest either a 36 X 48 or a 40 X 52″ size. It is pretty frustrating that there are no official standard quilt sizes but it also gives us a quilters a lot of freedom! 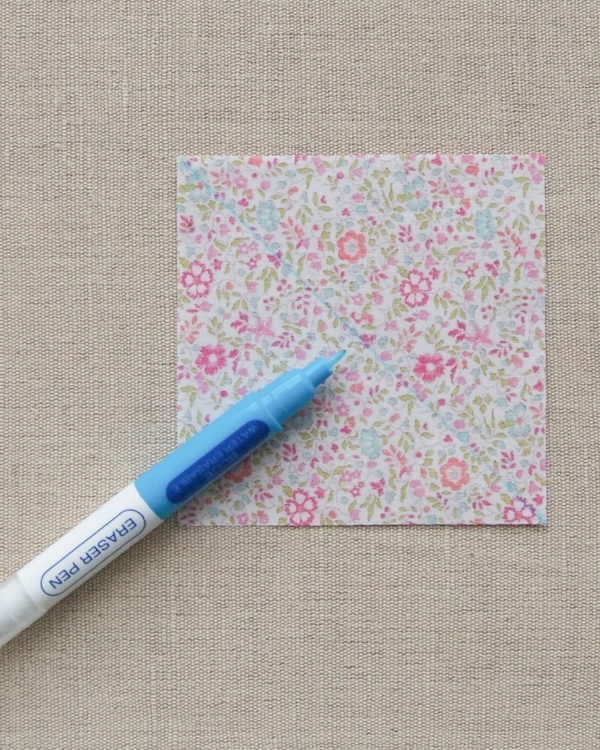 You can easily print or save any of our free patterns as a PDF by using the PRINT button! If you’re on a desktop version of the site, you will find the Print icon in the right margin just below the Save to Favorites button. If you’re on a mobile version of the site, you will find the Print icon below the pattern and above the comments. It got me thinking about asking your creative tasteful crew if you had ever considered designing quilt patterns with children’s literature as inspiration. I have a friend about to be a mom and I would love something soft and gentle and lovely and this quote made me want to do something about Charlotte’s Web but not a literal or bright and busy pattern but a soft, sweet restful charming rendition. If any could pull that off it would be Purl Soho. I think it would be a popular line to make as gifts. Just a thought. 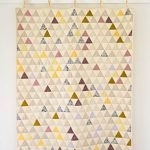 I’m thinking about making this quilt for a full or queen size bed, but want to save on cost. 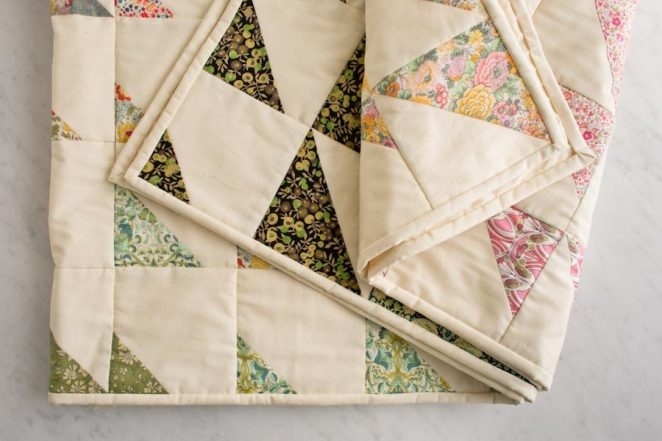 Instead of buying another Liberty bundle, I’m considering making the quilt as is, but adding a border around it with the same natural color muslin. If I go this route, how much muslin would you estimate? Thanks! I think you’d need an extra 4 yards of 45″ wide muslin to blow it up in this manner. Please let us know if you have any more questions! Hello! I’m currently in the process of making this quilt. One question on the size of the first HSTs that are made (the 4 7/8 squares). When I place the two squares together, sew a quarter inch seam away from the center of the bias and cut them, my squares don’t equal 4 1/2, they are 4 1/8. Any ideas what I may be doing wrong here? Also, on a side note, how, when piecing the blocks together, are the points on the HST not hidden in the seam allowance? It sounds like you may not be measuring something correctly. The 7/8″ HST measurement is a tried and true quilting method so I’m sure the directions are correct. I would double check the cut squares, and then mark the centers very clearly and make sure to use your 1/4-inch foot for the piecing. I’m not sure what you’re asking with the points of the HSTs. When piecing all of the squares together you’ll be using a 1/4-inch seam allowance on every side of each block. The points on the HSTs will be at the top corners once the blocks are pieced. Please advise how to measure and make hanging hoops for back of quilt. Also what are measurements for wall board that you hung quilt onto. Thank you. The loops we used are just temporarily pinned on with safety pins and we don’t recommend hanging a quilt that way in the long term. The pegs in the photo are 8-inches apart. Thanks for getting in touch! 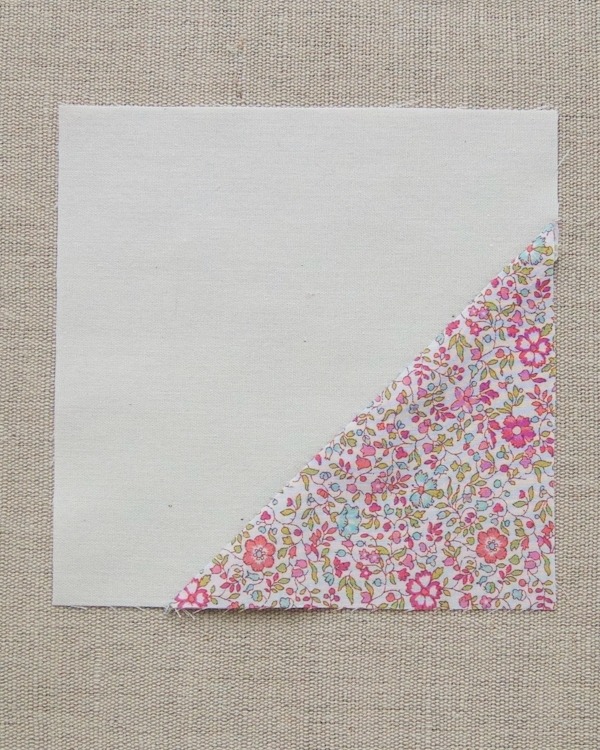 If you enlarge the squares by 2inches to make a larger quilt, is one Liberty bundle enough? Thanks for writing in! I am not sure if by enlarging each square by two inches, you will have enough fabric. I can say that you should have roughly enough liberty in the bundle for 2 quilts of the same size. I hope that this information is helpful for enlarging your quilt! I am going to make this quilt. I have the Liberty Rainbow set, and want to purchase the muslin. 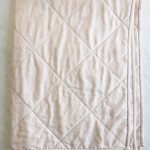 The pattern calls for the “Natural” muslin color, but the picture of the finished quilt looks to have a much lighter color than the picture of the muslin for purchase. Is this just a coloration issue on the web page? Looking forward to getting started. Thanks for the question. The Moda Muslin 200 ct. on the Shop page does seem a little dark, but nonetheless this is what we use in the quilt. You’ll find it’s more of a light tan/almost cream in person. Thanks! Hi! I am in love with this quilt. I normally don’t orewash my quilting fabrics but haven’t worked with lawn yet. Can you tell me how you prewashed everything? Did you have a problem with the ends unraveling? Thanks in advance! Thank you for writing in! We recommend prewashing the fabric in the same manner that you plan on washing the finished blanket. We haven’t had much problem with the Liberty fraying in the wash but you are welcome to zig zag stitch around the edges if you want to be safe. Please let us know if you have any more questions! I just downloaded this pattern and wished to thank you and to say I hope mine turns out as good as yours. Thank you for being so generous. If i just wanted to order a few colors to create this, what is the actual total yardage needed of the liberty prints as opposed to the bundles. I think that ordering one or two of the liberty prints and cutting it down is more my style. How much should i order? Thanks for writing in! Great question! For the Liberty, you will need roughly 2 1/2 yards to complete a quilt of equal size. You can divide this up among prints how ever you would like to make a color story that you are happy with! Can I make a smaller version of this for a stroller? You most certainly can make a smaller version. You would probably want to divide the size in half, which would make the finished size 26 by 30. Many thanks, I wondered if I needed to make the square sizes smaller or do you think just dividing the finished size in half would still look ok? If you divide the finished size in half and leave the square sizes the same, it should still look fine. Would you be able to estimate how many yards TOTAL of the liberty fabric are required? I’d like to try making this with just two colors of fabric (one color in place of all the liberty patterns, and one in place of the natural muslin) but I am having a hard time figuring out how much to buy! Thank you so much, it’s a lovely pattern. Just finished this project – thank you so much for such clear instructions – it was my first quilt. I used your watercolor linen. Starting this quilt- so excited :). Can you tell me how big should each finished block be? How exciting! Congratulations on endeavoring on your first quilt project! 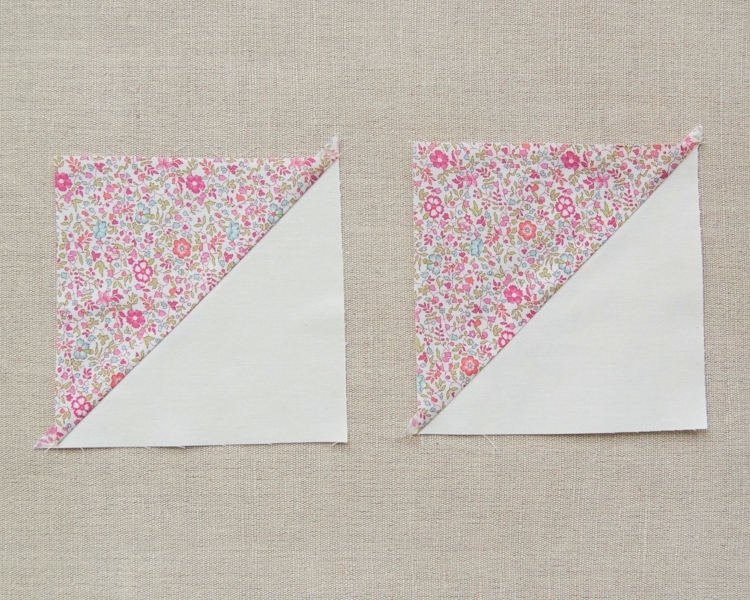 Each square should be 4 ½-inch before sewing them together! I noticed that the Warm Half Rainbow Bundle is out of stock in fat eighths, but the Color Wheel Quilt Bundle in fat sixteenths does contain the warmer tones and is still available. Is it possible to make this quilt from fat sixteenths instead of fat eighths? It seemed possible when I looked at the numbers – you’d just need to get a little creative with the cutting. Thanks for writing in! Sadly, given the cut requirements, it is not possible to get the 6 squares required from the fat sixteenth of fabric (8 x 12 inches). Even with careful cutting, you would need to piece some of the small squares together to make it work. It you are willing to piece some squares, you may be able to do it but it leaves very little room for error and could be quite a challenge. You can certainly sign up to be notified when we have the bundles back in stock! Thank you so much for this gorgeous pattern! I used the Memoire a Paris fabric from Lecein and it was perfectly suited. I wish I could share a photo of the completed quilt. Thank you for sharing your experience! My goodness, this sounds like an exquisite quilt, I’m so happy it worked out! Thank you so much….love the quilt ! Thanks for writing in! I am happy to help! 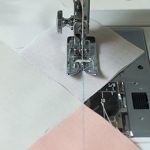 With the 4 7/8″ squares, you are sewing them together a 1/4″ from the diagonal mark and then cutting on the central mark. While this does equal 1/2″ in total taken away, it is taken away on the diagonal and as such does not equal 1/2″ on the straight measurements. 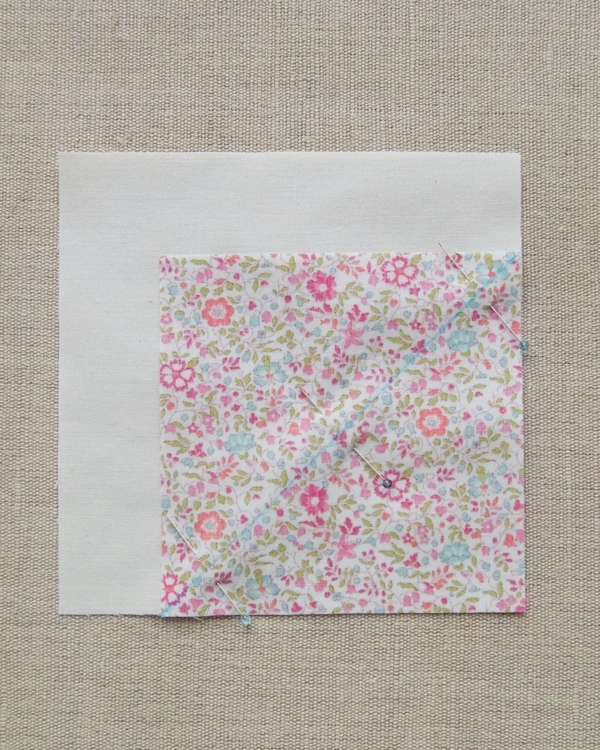 The resulting square from this piece will be 4 1/2″. If you were to start with 5″ squares, the resulting square would be larger than the 4 1/2 inches that all of the resulting squares will be! Thanks for reaching out! After piecing the quilt top and accounting for seam allowances, each square measures 4 inches in the completed quilt. If you make your quilt 23 squares by 27 squares, or 621 squares total, you will end up with a 92 inch by 108 inch quilt.